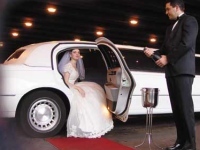 We've found all types of wedding day transportation in New York to fit your matrimonial needs. Whether you need limo services or horse drawn carriages, explore our guide to wedding transportation services in New York. Make a grand entrance by browsing through our list of horse drawn carriages for weddings in NY. Find out prices for horse drawn carriages rentals for weddings in New York. Book wedding limos in NY that best fit your budget. Choose from a wide selection of wedding limousines in New York, many of which are available in the color of your choice.